The surfing vibe that Valdoviño usually has will come together this weekend with the Campeiras Live Festival, a free activity, supported by our Maeloc ciders. During this festival surfing will go hand in hand with free classes, skateboarding tricks, and a range of concerts of different styles, such as indie or garage. The music kicks off on Thursday 30 July with the concerts of Masito, Lois, Milk it, Sen Senra and Oh My Cat. On Friday Cora Sayers, Club del Río, Cristina Irezabal, Puma Pumku, Los Nastys, Nistra, Ego Fum Papa and Miqui Brightside will play. On Saturday 1 August Alex Casanova will start the day off at 2pm followed by Smooth Ends, Way Cool García Show, Black Maracas, The Parrots and Pelas. The festival will close on Sunday 2 August with the music of Juan Díaz-Terán and Natural Green at 2pm and 6.30pm, respectively. The concerts will be combined with diverse gastronomic proposals accompanied by Maeloc cider at the “Chiringuito A Saiña”, “El Palmar”, “As Crebas” and ”El Camping Valdoviño”. 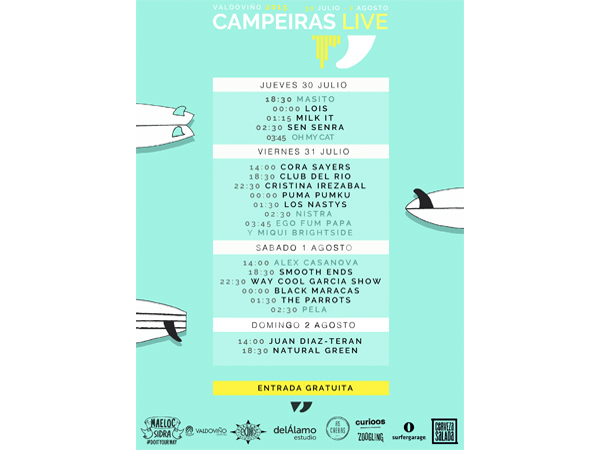 The festival is organised by Campeiras Surf, the surf camp that is traditionally held in Valdoviño, and that on this occasion has decided to add other activities such as skateboarding to its programme. There will also be an area full of stands where young designers will be able to put their creations on show, and where different sports labels, such as Knock, Zoogling, Curioos and Vaas Senber, will be present. The aim of this festival is to offer all surf fans a complete experience by coming to Valdoviño and enjoying an all-round programme in great surroundings in the area of Ferrolterra. An unbeatable platform for young hopes to get themselves seen.